A fascinating range of Primulas include, primroses, cowslips, polyanthas and oxlips, many different flowers and species including primula vulgaris, veris and other easy care varieties. All are for sale in the UK from specialist Primula Nurseries. 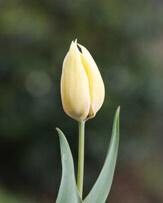 Found widely across the northern hemisphere and also down into South America these are spring and summer flowering. If you take the time to look after these wonderful plants then they will reward you with a wonderful display of flowers every spring and the first primulas begin to shoot up these colourful flowers your efforts will be rewarded. Generally not difficult to grow and are much sought after, primula auricula, primula candleabra, auricula	grandiflora, Primula 'Belarina' and primula vulgaris or 'native primrose' being very popular. Most gardeners are familiar with Primula vulgaris, however species such as P.capitata (pictured top right) which is from Asia, with its drumstick flowers, and P. allionii which is from France and Italy are both very special in their own ways. P. allionii (pictured below right) lives amongst the limestone rocks, in dark spots hidden away. We have a lot of questions about basic primula care, mostly relating to 'disappearing primulas'. It needs to be understood that although primulas like moisture, they also like good drainage, and this is true both when growing in the ground as well as in containers. In the UK we can have wet winters, and even wet springs and summers it is this moisture we need to control. If primulas stay wet over winter, they can simply rot. The first step in looking after primulas is selecting a position that gets good light in the spring and dappled shade in summer, although in the UK we do not usually get the hot sun that will dry the soil and damage the plants. Soil preparation is the second step, make sure the drainage is good and dig in some well rotted compost. In areas prone to wetness try lifting the garden bed a little to prevent the plants from rotting. Make sure you provide fertiliser in the form of additional compost, worm castings or even a slow release type. 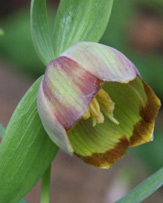 Species and growing conditions range as they are a varied group of plants including primrose, polyanthus and cowslip. With well over 400 primula species and literally 1000s of hybrids the variety is almost endless however basic care is the same. A major factor is becoming waterlogged, and thi s is not just related to waterlogged soil, it can also happen in pots and containers. The problem with pots is that they retain most of the moisture in the bottom 1/3 of the pot itself. This may not seem a big issue, however over a long wet period, pots that are sitting on the ground, or any flat surface can have the drainage holes blocked, the water pushes fine materials down which settle in the drainage holes, they dry out and harden a little when the rain stops, and then the same thing happens when the rain starts, until the drainage holes block, and the pots get flooded. The primulas will then just rot away. So lift your pots off the ground, and provide some shelter from those winter rains. 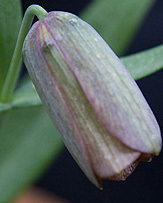 Generally regarded as either a cottage garden favorite, or a display plant in the UK. With over 400 species of primula a general growing and easy care guide is to provide a moist, shady position, humus rich soil and don't let primulas dry out during summer. Which varieties to buy ? If you are looking for something really spectacular, the rare Primula vialli or 'Orchid Primrose' is worth seeking out at rare plant fairs, purple flowers in spikes, unusual. Primula Veris or 'Cowslip' and Primula vulgaris pictured right are two of the best known of the primula species. 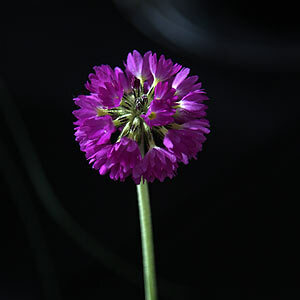 Primula vialii with its upright flowers purple with a red tip is and outstanding garden plant. Primula bulleyana or 'Candelabra primula' are also an outstanding addition to the garden. 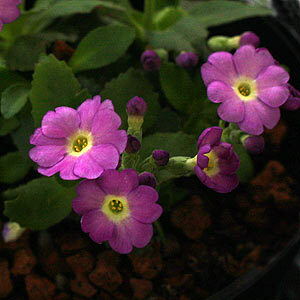 Primula japonica or the 'Japanese Primrose' come in a wide range of colors . 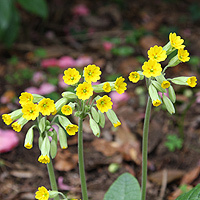 The common Primula vulgaris may not be as showy as some of its relatives but is easy to grow in the garden. 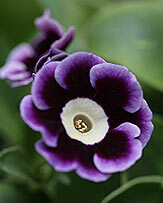 A leading grower and supplier of authentic quality primulas and auriculas. 11 rue du pont blanc - 22310 - Plestin Les Grèves. Mail order suppliers of hand-pollinated primula seed. From Brittany we send seeds worldwide and plants within France and Europe (outside Europe by special request). Incl. Primroses, Polyanthus, Asiatic primulas and Auriculas.